121BC Hong Kong is the younger sibling of 121BC Sydney, both of which feature Andrew Cibej at the helm. The ricotta panna cotta with espresso caramel and almonds at the Peel Street osteria is rich, thick and indulgent. The caramel sauce bears similarities to a crème caramel, while the espresso curdles perfectly with the milk making it, in effect, a deconstructed flat white in dessert form. The almonds round off the dish with a very welcome depth and bite. $80, 42-44 Peel St, Central, 2395 0200; 121bc.com.hk. Ricky Cheung, former executive chef of Scala at the Renaissance Harbour View Hotel and owner of Wan Chai French seafood restaurant Le Mieux Bistro, recently opened Bistro Bon in the Baptist University campus in Kowloon Tong. Serving Mediterranean and Asian fusion delicacies for student budgets, the Horlicks panna cotta with crunchy chocolate brings a touch of nostalgia for lovers of the malted milk drink. Served in a ramekin-esque ladle, the rich and crunchy chocolate balances the smooth, milky panna cotta. $40. Bistro Bon, G/F, Dr. Ng Tor Tai Int’l Hse, Baptist University, 32 Renfrew Rd, Kowloon Tong, 2628 0330. Stunningly decorated Bangkok import Issaya Siamese Club doesn’t hold back on the theatre, with many dishes presented tableside to a chorus of “oohs” and “aahs" from diners. One dish which does all the talking though is Issaya’s jasmine flower panna cotta, simply presented on a banana leaf and served with jasmine rice ice cream and rice tuile. 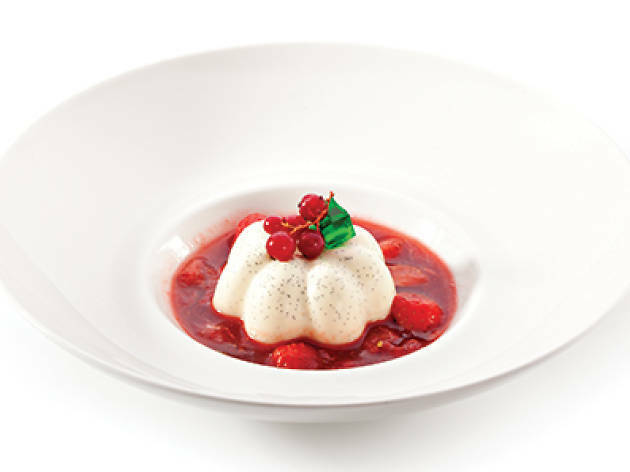 Though the flower is present in all components of the dessert, the flavour remains fresh and delicate. The fragrance complements the creamy sweetness of the panna cotta and the tuile provides a satisfying crunch to this elegant dessert. $85, 25/F, Midtown Soundwill Plaza II, 1 Tang Lung St, Causeway Bay, 2154 3048; issaya.hk. Joyful Dessert House was one of the local favourites listed in the 2016 Michelin Guide Hong Kong’s inaugural street food list. This small, casual joint offers Western-style desserts such as green tea lava cake and mango napoleon, as well as a smooth and creamy Earl Grey panna cotta. The sweetness of the cream complements the citrusy tang of the bergamot in the tea and is even served in a quaint teacup. Pinkies up! $52, Shop 2 & 3, G/F, 74 Hak Po St, Mong Kok, 9688 1772; joyfuldessert.com. 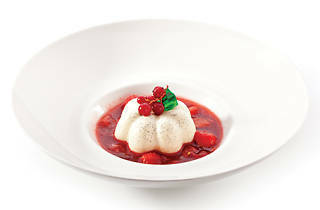 Nom’s fennel and liquorice panna cotta with homemade granola and blackcurrant sauce may not sound universally appealing, but Chef Fabrizio’s subtle use of the usually divisive fennel and liquorice in this rich panna cotta gives away just a hint of their powerful flavour profiles. The tartness of the blackcurrant sauce undercuts the glycyrrhizin while the hearty granola gives welcome bit of texture to this smooth dessert. Even if you’re not a fan of liquorice, trust us on this one – it’s one of Hong Kong’s best. $98, 5 Elgin St, Central, 2540 7988; nom.com.hk. This beautiful Balinese restaurant spared no expense in importing its furniture from Indonesia and, combined and with a view over Repulse Bay beach, transports you instantly to the Island of the Gods. The coconut panna cotta is a suitably tropical affair, topped with roasted pineapple and cinnamon black rice ice cream. Elegantly presented with golden pineapple and edible flowers resting on top, the acidity of the pineapple is mellowed by the coconut – a nod perhaps to a piña colada. The cinnamon black rice ice cream meanwhile adds a toasty, spicy dimension to this palate-pleasing dessert. $80, 3/F, The Pulse, 28 Beach Rd, Repulse Bay, 2515 0577; tri.hk .